Beginnings: We asked Four of our Members the question: How do you start a creative dialogue? Getting Started is the hardest part, staring at an empty blank page in a crisp new sketchbook with white pages is intimidating. 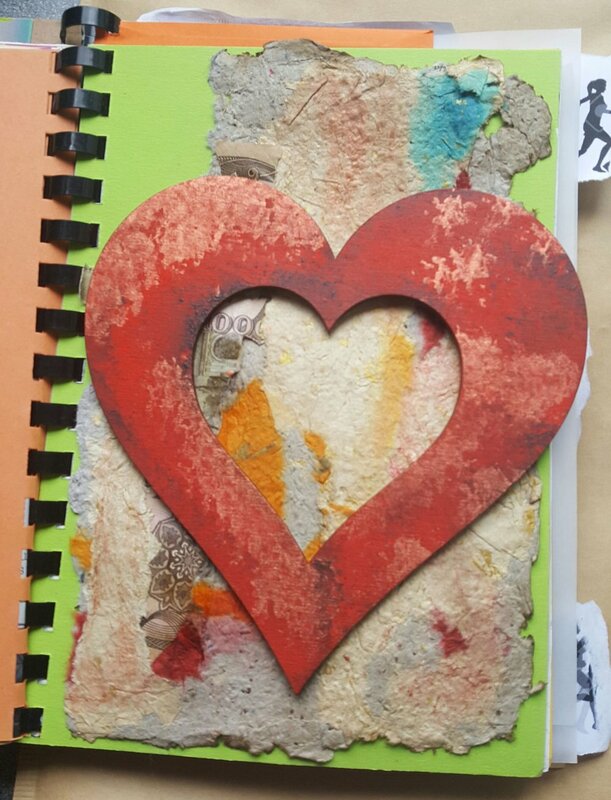 I have been part of the circle since it was introduced to the TEA group and in the last couple of years I have switched from brought sketchbooks to making my own. Including this year, I have collected a range of papers different colours and different styles to encourage a more creative approach and avoid a creative block of staring at an empty white page. I enjoy working on tracing paper, envelopes and have a slight obsession with luggage labels (they seem to fit in with any book and theme). I find I am a bit of a contradiction in my approach in that I love to view the work of others that seems to be spontaneous, messy and layered but find it difficult at times to stray away from neat, precise and controlled. The past two books I have worked on have been ring bound to allow more freedom to work on the pages. I have included different sizes of paper and envelopes are great to hide or reveal. A lot of the inspiration for pages and ideas for the books have come from the workshops that I have participated in as part of the circle. Book binding, Zines, printmaking and photography have really stood out. Even the snippets I have seen from those I have just seen the outcomes for have been a great influence. Themes have varied from natural forms which can be a bit safe but a theme that I always find myself returning to. To toys, figurative work and sometimes a mix of everything. The thing that makes the circle so appealing is that there isn’t a right or wrong approach. You can work in any format the starting point can be anything and you have the freedom to let it evolve to a completely different outcome. 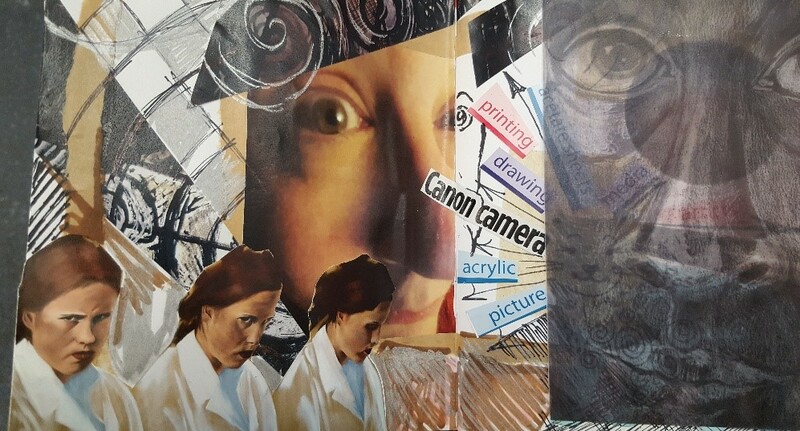 I have found myself working much more in mixed medias and really enjoy using a lot of collage in my work. Through the influence of seeing so much on the social media pages I used a lot more text in my work. Depending on the partner you have being part of the circle really pushes you to work in different styles and out of your comfort zone. My aim for this year is to use more textiles in my book as it is an area I am not particularly confident in, but sewn pages and adding more texture to my work would be an interesting development. 1. Select a really lovely book. Sniff, hum and ha, put it back on the shelf. Repeat several times from you vast collection of lovely books that you are saving for the 'right' project. 2. Spend several minutes/hours/days selecting said right book - however many you think necessary. But not longer than a month. 3. Having selected the book, decide to not use it and make your own from interesting scraps of paper. 4. Get your paints/drawing/sewing stuff out. Realise that what you want isn't in the pile and spend 2 hours looking for it. 9. Have several cups of tea. 10. Stare at book and eat biscuits. 13. By this time, it's G&T time, so knock yourself out, have a large one. Or two. Give up and go to bed. 14. Get up the next morning and realise you can't use the dining room, sneak past it and go for a 3 mile run. While out, have a lightbulb moment that you can actually record your return to running in your sketchbook, get home, sign up for a ultra marathon and/or triathlon (just so your sketchbook looks really interesting) and attack your book with vigour, printing images from your run, weaving photos, painting over, printing. Wait for it to dry and then stitch in. 15. Have a real sense of achievement and award yourself with an episode of Vikings. Then have the awful realisation you just paid a small fortune to torture yourself in a triathlon and agreed to a friends suggestion of an ultra marathon. 16. You can then leave out steps 1-13 and start from step 14. I have always kept a sketchbook but each lasted for years. I spent a lot of time promising myself I would do some work in them, but never doing as much as I wanted to, I think I had lost the habit of practising as an artist. 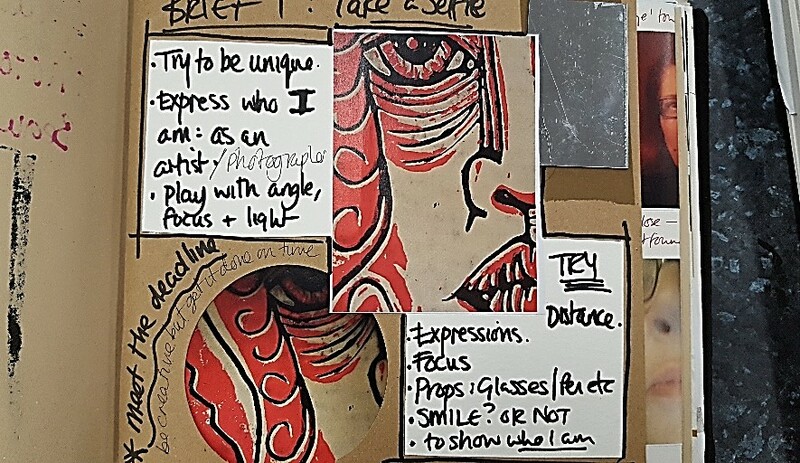 In 2015 I started the sketchbook circle collaboration and felt the pressure of communicating visually with another artist. One of my worries was how to start. I wanted to share who I am so began with self-portraits and some annotations of artists, ideas and hopes for what I wanted to do that year. I stuck in some of my current lino print development and outcomes. I also added some of my portrait photography and some of the artists and art movements that were interesting me at that point. I also added an ‘introduce me’ page. It felt good to write an ‘ice-breaker letter’ to this person I had never met sharing how I felt about participating in the project; my hopes, what I was nervous about and what kind of practitioner I was. I was pretty sure they were likely to be having the same feelings. As a first timer I am not sure which I was most nervous of: working in someone else’s book or another person working in mine. Of course, it all turned out fine. Whoever my partners are for this coming year I look forward to it. Sketchbook Circle encourages you to be brave and enjoy being creative.